Cisco has rolled out new security patches for a critical vulnerability, tracked as CVE-2018-0101, in its CISCO ASA (Adaptive Security Appliance) software. At the end of January, the company released security updates the same flaw in Cisco ASA software. The vulnerability could be exploited by a remote and unauthenticated attacker to execute arbitrary code or trigger a denial-of-service (DoS) condition causing the reload of the system. The vulnerability resides in the Secure Sockets Layer (SSL) VPN feature implemented by CISCO ASA software, it was discovered by the researcher Cedric Halbronn from NCC Group. The flaw received a Common Vulnerability Scoring System base score of 10.0. According to CISCO, it is related to the attempt to double free a memory region when the “webvpn” feature is enabled on a device. An attacker can exploit the vulnerability by sending specially crafted XML packets to a webvpn-configured interface. Further investigation of the flaw revealed additional attack vectors, for this reason, the company released a new update. The researchers also found a denial of service issue affecting Cisco ASA platforms. “After broadening the investigation, Cisco engineers found other attack vectors and features that are affected by this vulnerability that were not originally identified by the NCC Group and subsequently updated the security advisory,” reads a blog post published by Cisco. 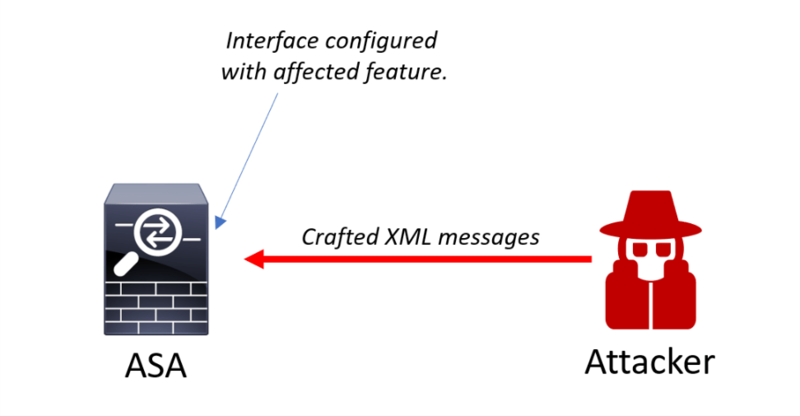 The experts noticed that the flaw ties with the XML parser in the CISCO ASA software, an attacker can trigger the vulnerability by sending a specifically crafted XML file to a vulnerable interface. According to Cisco experts, there is no news about the exploitation of the vulnerability in the wild, anyway, it is important to apply the security updates immediately.